Please note: When reading this, keep in mind that it gets a little complicated because there are two Jessie’s to keep in mind and many teachers. Jessie (Lytle) Robinson is the grandmother of Jessie (Johnson) Jesmer. Link to Arthur and Jessie (Lytle) Robinson, Jessie Jesmer’s grandparents. Link to the Jesmer family history page. George A. Johnson and Lillie are the parents of Jessie (Johnson) Jesmer. As a child Lillie had lived in the Paswegin Saskatchewan area. Previously, her family lived in Manitoba and North Dakota. 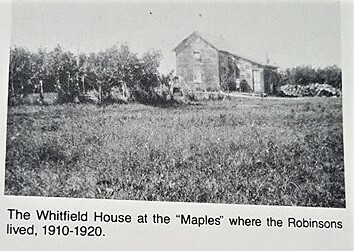 Her mother (Jessie) had previously lived in Clair Ontario and Wooler Ontario. Lillie had, at one time lived in Flin Flon Manitoba. In 1943 they were recorded as attending a Robinson family reunion. Lillie had eight other siblings. 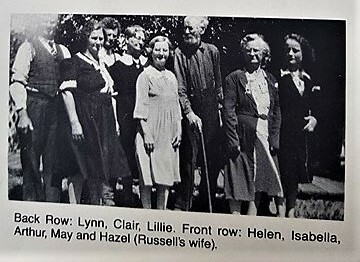 The siblings of Lillie (Robinson) Johnson were; Lynn, Clair, Isabella, Helen, Francis, Aubrey, David Russel, Hugh Allen. Hugh Allen had died as a young child of diphtheria in 1902. The children of George and Lillie Johnson were; Jessie (Johnson) Jesmer, Aubrey, Louise, and Alva. Jessie Jesmer is the daughter of George Johnson and Lillie Robinson. She was born on July 25th, 1912. Her siblings were Aubrey, Louise and Alva. Her grandparents, on the Robinson side, were Arthur and Jessie Robinson. 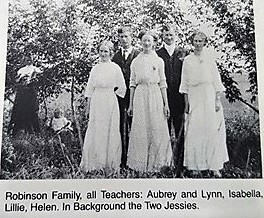 Jessie Jesmer had come from a family of teachers, where many of her aunts and uncles on the Robinson side of the family were teachers. Jessie’s mother, Lillie was also a teacher. Jessie’s uncle: Clair Robinson: (He was a farmer. He was single. He lived in the next farm over, from the farm of Harvey and Alice Jesmer.) Jessie was encouraged to get involved in the debating club by her Gramma Robinson and her Aunt Bella. Bella Robinson: She was Jessie’s aunt. She was the Post Mistress of the area. She had inspired Jessie to read. Jessie’s mother, Lillie also inspired Jessie to read. Eventually Jessie became a teacher. There was also a Mr. Robinson who was a radio announcer in Watrous Saskatchewan. He broadcasted farm information stuff.